Nominations for any award, except the Eugene R. Wilson Award, may be submitted by an individual AFP member or an outside individual or organization. Eugene R. Wilson Award nominations may only be submitted by AFP members. Entries for all awards must be received by 5:00pm on May 15, 2019. Late entries will not be accepted. All nominations, including letters of support, must be submitted online. Nominators should complete the nomination form online and submit it, along with supporting documents, as a PDF or in a Word document. Please include the award category for which the nomination is being submitted in the subject line of the email. Each nomination should include the nomination form, the narrative and any supporting documents. Narratives should be a maximum of three pages (12-point format, 1” margins, single-spaced). Address each criterion separately in your entry in narrative form. Concise paragraphs that clearly answer each criterion point will receive a higher score from the judges. Supporting documents are accepted but should only enhance the narrative and not be used instead of the narrative to answer the criteria. No more than ten pages of supporting documents are allowed. When including supporting documents, the narrative should discuss the documents. Do not introduce new information in the supporting documents. The AFP Alaska Chapter Annual National Philanthropy Day awards program recognizes outstanding achievement by individual, foundation, and corporate philanthropists, fundraising volunteers, and professionals in philanthropy. In professional fundraising, such individuals and organizations form a vital partnership with charities and the nonprofit sector to ensure that the needs of all citizens are met. It is right and proper, therefore, that AFP honors those who hold high ethical standards and best exemplify commitment and dedication toward helping society. These awards are given in recognition to those individuals and organizations whose life-time or long-term achievements have made a significant impact upon society. Honorees will be selected by members of the AFP Awards Committee, which consists of AFP members and at least one voting Board member. Because of the number of applications submitted, it is not possible to provide nominators with written evaluations of their entries. If, in the judgment of the committee, no applications in a particular category meet the criteria, no award will be given in that category. All categories will be awarded having met the Chapter’s selection criteria and historical high standards of achievement. The individuals and organizations selected will receive their honors at the AFP Alaska Chapter’s Alaska Philanthropy Day Awards Luncheon on Friday, November 15, 2019. They will be notified of their selection by Thursday, June 6, 2019. Honorees, or a representative, must be present to receive the award. Evidence of encouragement and motivation given to others to take leadership roles toward philanthropy and community involvement. (0-15 points). This award honors an individual or family that demonstrates outstanding skills in coordinating and motivating groups of donors and volunteers for fundraising projects for the benefit of charitable institutions. The recipient must have demonstrated exceptional leadership skills in managing groups of donors and volunteers for major fundraising projects for more than one nonprofit organization. This award honors an Alaska individual or family with a proven record of exceptional generosity who, through direct financial support, demonstrates outstanding civic and charitable responsibility and whose generosity encourages others to be philanthropic. *Previous award recipients may be honored again, but preference will be given to individuals who have not received an award. This award honors an outstanding individual in the field of fundraising or philanthropy in Alaska. Nominees must possess a CFRE or ACFRE certification. 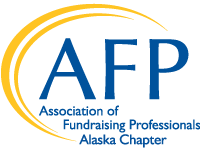 Nominees must currently spend a majority of their time on fundraising or philanthropy efforts and be a current member of the AFP Alaska Chapter. Nominations from AFP members are welcome with the selection of the award recipient at the sole discretion of the AFP Alaska Chapter Board of Directors. The Eugene R. Wilson Award will be presented to an individual who, through their actions and activities, has contributed to the development of a philanthropic culture in Alaska. This award can be given to a professional fundraiser, major/significant donor, funder, nonprofit staff or board member, or any individual deserving of special recognition for her/his significant contribution to philanthropy in Alaska. Nominations from AFP members are welcome with the selection of the award recipient at the sole discretion of the AFP Alaska Chapter Board of Directors and the NPD Selection Committee. The Eugene R. Wilson Award will be given periodically and is reserved for those deserving this special recognition. This award will be open for nominations on an annual basis, but might not be awarded each year. The Spirit of Philanthropy Award was created in 2018 in honor of Carol Rice, a deserving nominee that did not fit into any of the traditional categories. The award honors an individual, business, or other organization who shows extreme dedication and commitment to improving their community. This award is not open for nominations and is presented solely at the discretion of the Board and NPD Selection Committee.